Murphy vs. Sorokin Battle Rescheduled for California Hot Rod Reunion. An action-packed weekend of nitro-burning mayhem was unexpectedly cut short when rain at Firebird Raceway upended the Pepsi Nightfire Nationals ahead of the AA/FD Final Round, leaving semi-final victors Jim Murphy and Adam Sorokin in nitro limbo. Murphy and Sorokin will strap into their front-engine dragsters and settle their contest of wills at the California Hot Rod Reunion and last race of the NHRA Hot Rod Heritage Series Top Fuel Championship at Famoso Raceway in Bakersfield, California on October 20-22. 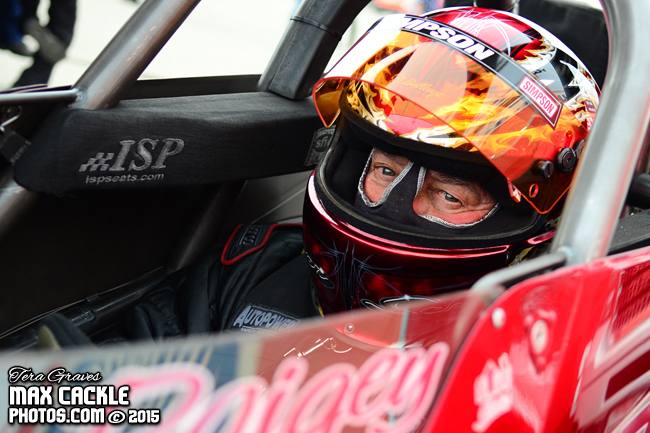 The long race weekend celebrating Firebird Raceway’s 50th year began with some unanticipated AA/FD news as a surprisingly missing-in-action Tony Bartone left an odd number of Top Fuel drivers battling for front-engine nitro supremacy in Boise. Pre-race rumors left some wondering if Bartone was setting up a fake out, but only seven AA/Fuelers made the call for Friday’s Qualifying, confirming the absence of the 3-time Nightfire Nationals winner and reigning Top Fuel Champion. Still, four Chrysler Hemis and three Chevrolets entered Boise, with drivers ready to prove which combination would prevail. Near 100-degree daytime heat saw teams take different tuning approaches. 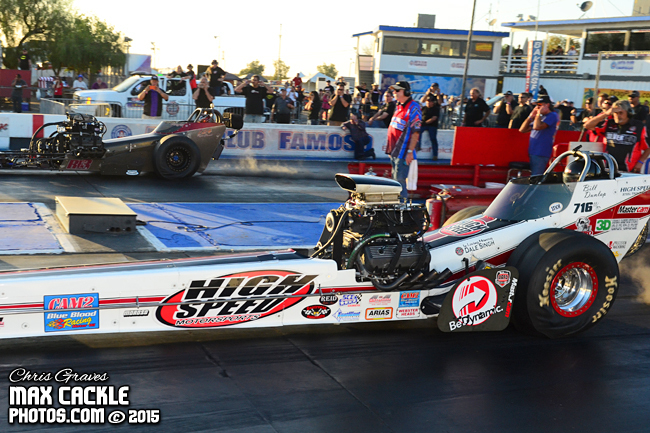 Mendy Fry launched the Hemi-powered High Speed Motorsports dragster to a 5.78 ET in Session One. Later in the evening session, she clicked off early for event Low ET and number one qualifying spot with a 5.69 at 219 MPH. Concurrently, Jim Murphy drove the Roland Leong-tuned WW2 dragster out the back door oiled in and on fire into the number two slot. Fry witnessed the fiery drama unfold in front of her as Murphy passed lit up and smoking. Fortunately, both drivers emerged unscathed. Dusty Green gave the Nitro Hemi all it had in every round of qualifying for a number three position. Bret Williamson not only drove the Mike Fuller Forever Young dragster to a number four AA/Fuel qualifying slot but also made number one qualifier and low ET behind the wheel of a fearsome Corvette Pro Mod. Adam Sorokin stepped up from a Session One mechanical mix up with a 6.01 ET at 214 MPH and number five qualifying spot in the Champion Speed Shop Chevy-powered canopy entry. Tyler Hilton ran the Great Expectations III through qualifying with some gear changes for a number six position, and Phil Ruskowski ran the small block Chevrolet powered Mighty Mouse into the number seven spot ahead of Saturday night Round One Eliminations under the lights. With Low ET Mendy Fry ran a bye in Round One Eliminations. The High Speed Motorsports car got up on the tire and danced at half-track, but Mendy kept the rubber in the groove in the face of headwinds. Adam Sorokin deep staged the Champion Speed Shop dragster and took the win with a 5.89 ET at 217 MPH over Bret Williamson’s 6.17 ET at 199 MPH. Jim Murphy launched the Hemi-powered WW2 to a 5.75 ET at 252 MPH win after Phil Ruskowski red lit his small block Chevrolet powered Mighty Mouse dragster to a 7.42 ET at 171 MPH. 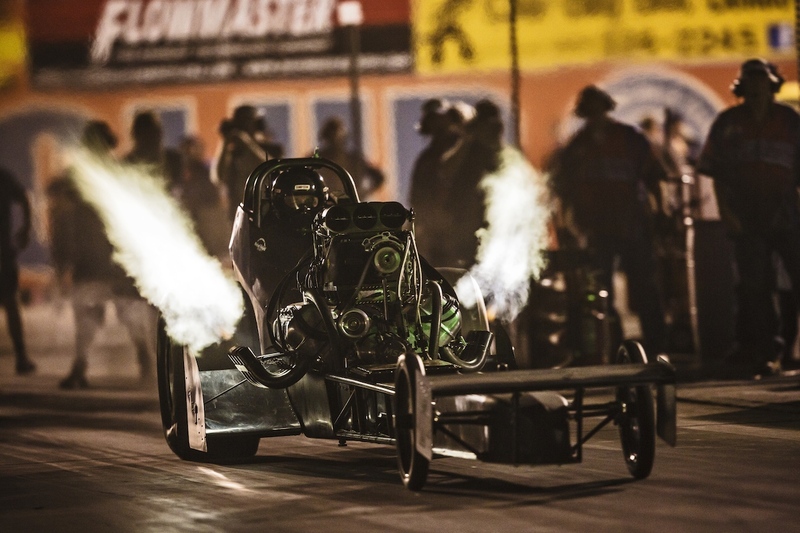 Dusty Green ran his Nitro Hemi flames on to a 5.92 ET at 240 MPH over Tyler Hilton who gave chase in his big block Chevrolet powered Great Expectations III dragster with a 6.32 ET at 219 MPH. The Chrysler vs. Chevrolet matchup continued as Sunday Semi-Final Top Fuel action saw Adam Sorokin and the small block Chevrolet prevail with a 5.92 ET at 192 MPH over Mendy Fry who red lit the High Speed Motorsports dragster and fouled out. Jim Murphy ran the WW2 to a 5.80 ET at 235 MPH over a hole shot and hard charging Dusty Green who gave the Nitro Hemi everything it had with a close 5.95 ET at 243 MPH, finishing just one tenth of a second behind Murphy. The Final Round stage was set for an epic Hemi vs. Chevy battle as crews thrashed through engine teardowns for a chance at victory. The battle and win would have to wait. Drops of late afternoon rain for the first time in months gave way to downpour into the night. Hope was held out for a few hours, but after measured deliberation, the decision was made to postpone the race. Falling temperatures in concert with a soaked track and more rain forecast through morning put an anticlimactic end to four days of superior drag racing action. Murphy and Sorokin will settle their Nightfire Nationals Chizler vs. Chevy score at the California Hot Rod Reunion following the 4th session in the NHRA Hot Rod Heritage Series Top Fuel Championship at the Nitro Nationals September 22-23 at Tulsa Raceway Park. 14th Annual Holley National Hot Rod Reunion, June 16-18, 2016, Beech Bend Raceway, Bowling Green, Ky. — With the 2016 Heritage Series Top Fuel points race wide open, over a dozen supercharged and nitro-powered competitors from across the United States are gathering their steeds in Bowling Green in anticipation of claiming this week’s 8-car AA/Fuel Dragster Eliminator at the 14th Annual Holley National Hot Rod Reunion. Among those mounting up will be Stockton, California’s Rick Williamson, driver of the “Team Craig” dragster and current Heritage Series points leader as well as the recent March Meet victor. Following the Craig gang’s entry out of California on I-40 East is a nattering menagerie of their enemies, including Adam Sorokin with the Chevy-powered Champion Speed Shop fueler — March Meet runner-up and #2 in the points — and veteran nitro-man Jim Murphy with his fearsome “WW2” railjob. Murphy, who is making the scene with his Roland Leong-tuned digger, won here in 2013 on a holeshot, but has struggled to find a consistent combination after that decisive weekend. At the Bakersfield March Meet, he appeared to return to form before an unfortunate top-end collision during eliminations rattled his concentration and compromised his effort. Similarly, New York-based Tony Bartone, the 2014 Holley NHRR winner and two-time defending Heritage Series Points Champion, has also seen his once-dominant form contract recently. Both Bartone and Murphy would love to repeat here, as a means of making the statement that their team has entirely too much knowledge, talent and gumption not to dominate. Moreover, a Top Fuel win by Bartone would serve as an emphatic punctuation mark to the deserved pomp and circumstance awarded to his crew chief, the legendary Steve Boggs who, in concert with his late brother Ron, will be anointed as an Honoree here this weekend. There are other scores to settle here: Rick White, driver of the hard-charging “Neal & White” machine out of San Diego, wants to undo the damage from a first-round loss at the March Meet, which transpired, ironically, after Rick set Low ET at that prestigious event with a ferocious ¼-mile clocking of 5.54 seconds. Additionally, Salem, Wisconsin’s Jim Young hopes to advance to the top of the points chart here and will light up the Kentucky concrete with his Chrysler-powered “Young Guns.” Fleshing out the field are Californian Brendan Murry, Paul Schultz’s “Spirit of Tulsa,” Tyler Hilton’s big-block Chevy-powered “Great Expectations III” from Virginia (by way of Ohio), Illinois-based Tim Cullinan, “Diamond” Dave Miller’s dragster from Atoka, Tennessee, Racine Wisconsin’s Jason Greenwood, Troy Ray’s new “Wildside II” digger out of Knoxville, Julius Hughes’ “Atlanta Speed Shop” special and 2011 NHRR Top Fuel winner Lincoln Hassell out of North Carolina. 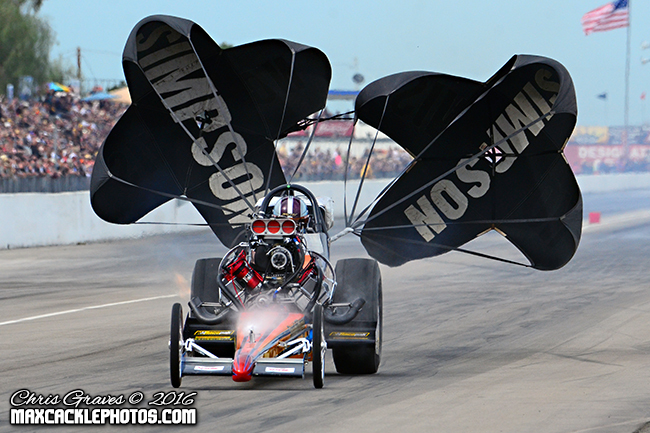 Bill Dunlap chases down Denver Schutz and claims his 3rd CHRR Top Fuel Title. 24th Annual California Hot Rod Reunion, Auto Club Famoso Raceway, Bakersfield, CA, October 25, 2015—In a final round of competition that was as poignant as it was dramatic, 74-year-old “High Speed Motorsports’” driver Bill Dunlap seized victory from the maw of veteran nitro-racer Denver Schutz and claimed his 3rd California Hot Rod Reunion Top Fuel Title. Dunlap posted a strong ¼-mile elapsed time of 5.69 seconds coupled with a commanding top-end speed of 255 mph to Schutz’s 5.83 at 252 mph, but the margin of victory was narrower than those number suggest as Denver “put out the top bulb” and deep-staged his “RE3” machine before dropping a stiff holeshot on Dunlap, forcing the quicker High Speed dragster to drive around his adversary. What happened on the pass? For Fresno-based Schutz, that was the second consecutive heat where spectators marveled at his unorthodox start followed by a nail-biter of a finish. In the semi-finals, Denver unnerved 2015 Points Champion, #1 Qualifier and odds-on favorite Tony Bartone with a similar mud-in-your eye startling line stratagem, deep staging and then expertly dropping a holeshot. This startled Bartone, who belatedly gave pursuit in a see-sawing battle. Schutz held off Bartone with a 5.90 at 241 mph to Tony’s quicker-but-losing 5.82 at 202 mph. Bartone added that a broken fuel line coupled with three dead holes four seconds into his run contributed to his loss. Schutz’s performance during his last two rounds was a near-perfect finale to what turned out to be his career curtain call. Moments after scoring his hard-earned runner-up finish at the 24th CHRR, 70-year-old Denver Schutz announced his retirement from the sport. Among other achievements, Denver was the 1998 CHRR Top Fuel Champion. Just after the CHRR Top Fuel final, Denver Schutz announced his retirement. 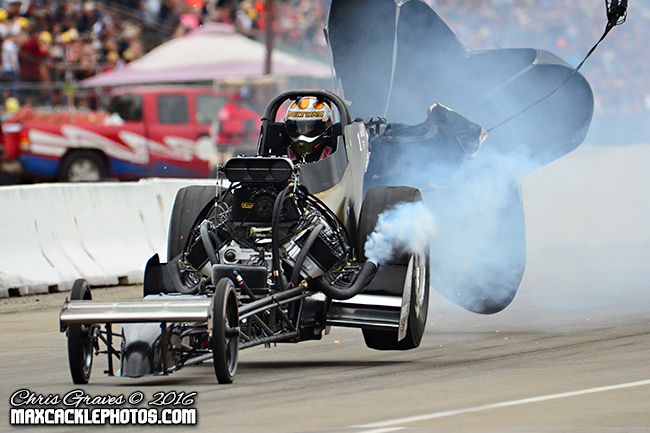 Top Fuel Qualifying Final Session: Friday, June 13, 3 p.m.
Top Fuel Eliminations, Saturday, June 14th, 11 a.m.